This is Pro Studio Grade Animation Bond (500 Sheets per ream) sold by the ream. It takes 4 REAMS to make a full CASE. If you want a full case order 4 reams. THE BEST ANIMATION PAPER IN THE WORLD ! This paper is a light cream color or soft ivory color so it is easy on the eyes and scans well. 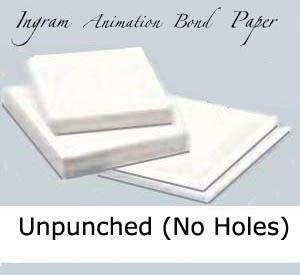 INGRAM ANIMATION BOND is a Premium Pro Grade (22 lb.) drawing paper. INGRAM ANIMATION bond paper has been used in the industryby the major studios for many years and is now available to schools and students of animation. Recognized as the finest in animation bond being used today for traditional 2D animation production. This is a heavy weight 22 lb. Pro Grade paper with a very smooth surface. It has a non-glare surface which takes pencil extremely well and is a pleasure to use...it also erases well and is smooth to the touch. There are no water marks to interfer with your image as you trace-back, clean-up or scan. Ideal for both students that want the best paper available and studios looking for high quality to meet production needs. Acid Free and Archival to be the Finest Animation Bond in the world! *NOTE: Select carefully...there are no returns or exchanges on paper once it has been shipped.